The leaves are still just changing to fall colors, but it’s never too early to make sure Santa Claus knows what you want for Christmas — he’s got an awful long list of people to get to on Christmas Eve. The one and only Santa Claus is arriving at the Cherry Hill Mall for the start of his six-week-plus stay on Nov. 10. The mall’s SantaFest event is free but does require tickets, which can be purchased at cherryhillmall.com. 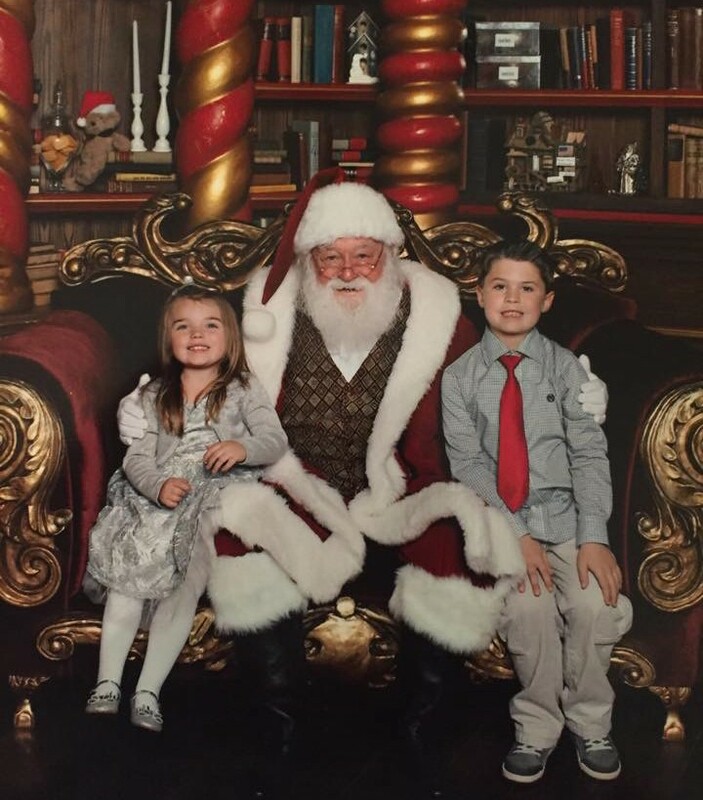 Personalized photos with Santa from SantaFest can be purchased, too, and you can take care of that ahead of time as well: https://www.santasfastpass.com/view/5809. If you are a member of the mall’s PREIT Perks program you can get in the Fast Pass line to see Santa, receive complimentary face painting, and receive a $10 shopping reward. This year’s theme at SantaFest is the movie “A Christmas Story.” Before they sit on Santa’s lap, children can tour Ralphie Parker’s house. (Just don’t shoot your eye out, kids). Just saw the A Christmas Story house replica yesterday while shopping @CherryHillMall – be sure to catch it before it goes away! SantaFest also includes holiday treats, games, crafts and appearances by other characters, including Rudolph, the Nutcracker, Raggedy Ann, a snowman and the Thanksgiving Turkey. A couple of weeks before arriving at SantaFest, while he was still in the North Pole preparing for trick or treaters, Santa Claus himself took out some time for a One-one-One with The Sun. The Sun: You’ve got a lot going on in the next few months. Is that exciting or stressful? Santa Claus: Oh, very exciting. The Sun: But when you say that, it still is a lot of work, isn’t it? Santa Claus: A lot of work. It is a little bit stressful, but it’s always exciting ready to go into the season. The Sun: What’s your advice for kids who are just starting to put their wish lists together? Santa Claus: I have a lot of kids that tell me that they have just about everything they need and (they tell me) to give whatever gift I was going to give to them to some needy kid. So I tell all of them to keep in mind that there are kids less fortunate than them. The Sun: That’s great advice. Because for every family that celebrates Christmas and takes for granted how great it is, there are surely kids that didn’t grow up with that experience or kids that don’t have that experience. So that’s smart advice. Inquiring minds want to know: what is your favorite Christmas cookie? Santa Claus: Well my favorite is chocolate chip. And/or whatever the current child’s favorite is. The Sun: OK. That’s a politician’s answer, that’s not Santa’s answer! Santa Claus: [Laughs for a while]. But they love it when you love the same cookie that they do. The Sun: That’s smart. But then again I guess Santa knows kids pretty well. Which reindeer have you had the longest? Santa Claus: That would be Dasher. The Sun: And is Dasher your favorite then or are you not allowed to have favorites? Santa Claus: They’re all my favorite. The Sun: [Laughs] What can you tell me about Dasher that not all kids might know. Santa Claus: He’s very intelligent. The Sun: OK. Is that kind of the older they are the wiser they are kind of thing? Santa Claus: That seems to be the case. He is a very intelligent reindeer. The Sun: Do you have a favorite Christmas movie or holiday TV special. It seems like everyone has a favorite. How about yourself? Santa Claus: Well, of course I like the classics like “Miracle on 34th Street.” But of the new ones, there is one called “Christmas Angel” that I particularly like. The Sun: “Christmas Angel” [writing it down], huh. OK, cool. That title reminds me of one I remember watching as a kid, “One Magic Christmas.” There’s an angel in that one, I enjoyed that movie. Santa Claus: This one would have been title Secret Santa if there hadn’t already been a “Secret Santa.” Because that’s what he is. They’d already made one called “Secret Santa” so they called this one “Christmas Angel.” And it fit. If you ever get a chance to watch it, you’ll love it. It’s a great movie. The Sun: I’m putting it on my list for sure. The Sun: Do you have a favorite Christmas song? The Sun: “Joy to the World,” why do you say that? Santa Claus: Well because that’s what we’re trying to do, bring joy to the world. The Sun: Smart, and a good message. There is a lot of Christmas music and, man, you didn’t waste any time, picked that right off the top, didn’t have to think about it. I like that. What’s your favorite non-Christmas holiday? The Sun: Why is that? Santa Claus: Well, we’re still on the same theme of unconditional love to all of the kids. The Sun: Yea, that’s smart. And the weather is always a little nicer than Christmas. What does Santa get up to on New Year’s Eve? Santa Claus: Oh, the beginning of an exciting new year. The Sun: Oh yeah? Do you have any special party with Mrs. Claus, or anything you guys do? Santa Claus: We usually bring in the new year and then take a long nap. The Sun: Do you stay up until midnight at least? Santa Claus: Oh yes. Always see the new year in and listen to all the bells and the firecrackers and fireworks. When the ball drops, we snuggle down and go to sleep. The Sun: OK, that makes sense. My next question goes back to those holiday specials. One of the ones I liked as a kid, I think it was called “Christmas Eve on Sesame Street.” It’s a good one, they do the Gift of the Magi story with Bert and Ernie, it’s really good. But one of the subplots is Oscar, you know, the Grouch, he keeps wondering how Santa is going to do this, and how he’s going to do that, and one of the questions he asks is [mimics Oscar’s tone] “How’s he going to get into the house without a chimney?” So my question to you: are houses without chimneys more troubling? Santa Claus: They’re not troubling at all. I have a magic key. The Sun: Oh. So those kids don’t have to worry is what you’re saying. Santa Claus: Yep, I have a magic key so I can get in without a problem. The Sun: I have a chimney but it hasn’t worked in a while. The Sun: What’s your all-time favorite Christmas gift? I know you give quite a few out, but is there any particular one you received that you liked? Santa Claus: Absolutely. Mrs. Claus. The Sun: [Laughs]. That’s smart! What does Mrs. Claus do on Christmas Eve and Christmas? Because we all know what you’re doing and have going on, but what is she doing behind the scenes? Santa Claus: Lots of cookies. And I’m very hungry when I get back so she has a nice big meal for me. The Sun: That’s great. What’s your favorite thing to eat besides cookies? The Sun: That’s good, always a good holiday staple. Santa Claus: Oh yeah. Love turkey. The Sun: Me too. My last question for you is a broad one and you may have answered it before but you can elaborate a little, the question is, what is the true meaning of Christmas? Santa Claus: Well, it’s teaching the kids, all of us, about unconditional love. It’s sharing that with one another. The Sun: And what’s the best way people can do that? Is it the small things? Santa Claus: Oh, yes, absolutely. Sometimes it’s the smallest things that make the most impact in my experience. It’s the little things that count. The Sun: OK, great. This is your platform here, so before I go, anything else Santa wants to share before we begin the holiday season? Santa Claus: Well I just want everyone to have a Merry Christmas this year.